Image example Na Ibrahim Babangida comot Buhari from office as Military ruler in 1985 and im rule till 1993. Confusion happen on Sunday as one statement claim say former Nigeria Military ruler, Ibrahim Babangida, don deny another statement where im first talk say make President Muhammadu Buhari no try contest election for 2019. Di wahala be say Kassim Afegbua wey bi talk-talk person for former Military ruler, General Babangida, dey insist say na im oga talk di thing wey dey for di first statement. Afegbua say na people wey no want make im oga talk di kain thing wey im talk openly, write di second statement wey claim say General Babangida no talk di thing wey dey di first statement. For inside di first statement, di former military president tell Nigerians make dem co-operate with President Buhari till im time for office go end - but make dem comot am for 2019. "Di next election for 2019 dey give us special chance to change wetin dey happen and bring fresh leadership wey go quick-quick begin heal di wounds for di land, wey go make sure say wetin di people want happen, and go make di country get unity." Dis statement from di former leader don join others from big-big Nigerians like former president Olusegun Obasanjo, wey dey ask Buhari make e no try come back for second term. Babangida, wey comot Buhari from military office for 1985 and rule till 1993, say: "we need to work with President Muhammadu Buhari to complete im term of office on 29 May 2019 and then make we prepare di way for new generation leaders to begin lead di country." Im say: "I dey offer dis advice as person wey get hand inside dis country, as former president, Nigerian wey get di country for mind, and person wey wan see new things dey happen as wey go make dis country get progress." 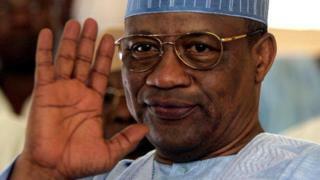 Babangida say wetin dey worry am pass na di way dem dey fight-fight and kill people for di nation. E write say: "Nigeria don turn to land where blood dey flow like river, where tears no dey gree dry up." "In di past few months, I dey look wetin dey happen for di country, and I dey fear well-well. From Southern Kaduna to Taraba state, from Benue state to Rivers, from Edo state to Zamfara, na so-so blood dey flow. For Dansadau inside Zamfara state , North-West of Nigeria, over 200 people just die, for no reason. Di kill-kill for Benue state leave me dey scratch head if true-true dis na di same country some of us fight to keep together," na wetin im add. E still add say di war against Boko Haram suppose enter inside Sambisa Forest well-well. No be di one wey government go dey react to wetin di militants dey do. As another statement don show wey claim say General Babangida don deny di first statement, e never dey clear wetin people go believe now.